Most of you are familiar with Katrina, of Pugly Pixel. She was one of the four lovely ladies who guest blogged for me, last time I was out of town. For those of you who aren't, head over to her blog immediately, or the next time you have a couple hours. She has amazing downloads, tutorials, and photos. 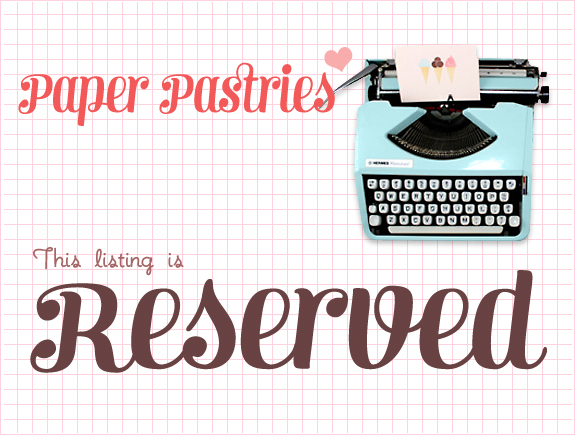 A new project of hers, Powered by Pastries, is dedicated to revamping blogs, websites, and online shops. I've been feeling pretty down in the dumps lately so I thought this could be just what I needed. When in doubt- always go to a professional! I don't have moo cards anymore, but when I did, this one always got such a great response, so I told Katrina I'd like it to be incorporated somehow. These are what she came up for my new shop avatar (above) and banner, below. l couldn't be more pleased! I love everything about it, the layout, the hearts, and how she turned the typewriter a pretty shade of blue. Don't you just love them? I highly recommend working with Katrina, she is a great designer, and most importantly (at least I think) a great communicator! Katrina, you've made my week a whole lot better- thank you so much! And for my readers, I'm sorry I've been awful this week- I've been in a foul mood up until now. I promise I'll make up for it next week, have a great weekend! Check out my updated shop, looks great! Ooh, I loved the old header but these are fantastic. I love Pugly Pixel. Both old and new headers are on my Pinterest board, "Heavenly Headers".